Introduction – Netting is the process of offsetting Payables with Receivables to partially or completely clear the open items for same Supplier & Customer. In an organization receivables and Payables transactions occur between the organization and the business partners. Such receivables and Payables items are posted to the respective customer or supplier account. All the receivables and Payables pertaining to a customer account is processed in customer account monitor and similarly the due/open items pertaining to a supplier account is processed in the supplier account monitor. Netting business option enables you to club these receivables and Payables to clear all open items. 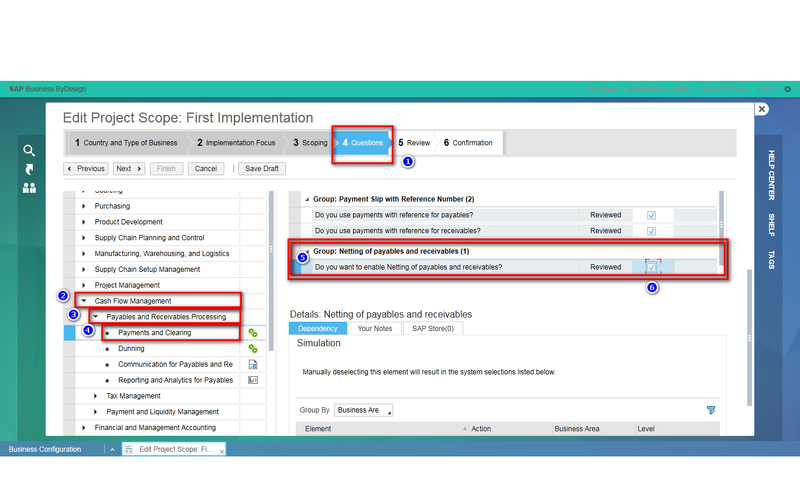 In the Questions step –> select Payment Clearing in Payables and Receivables Processing under Cash Flow Management. Check the statement related to Netting of Payables and Receivables. You have maintained netting relationships between two business partners. You can do so in the customer and supplier master data. 1. Go to Business Partner Data WoC –> select Business Partner view –> find Supplier (AMS Pvt Ltd). 2. Click on Create As button & select Account to create the Supplier as Customer. 3. Supplier (AMS Pvt Ltd) is now created as a Customer. 4. Goto Receivables WoC –> Customer Account –> check the Trade Receivables. 5. Also, go to Payables WoC –> Supplier Account –> check the Trade Payables. 6. Click on Clear Manually button on either Supplier or Customer account. 7. Here, you can see open documents for both Payables & Receivables. 8. So here, you can choose the documents which you want to clear as I have shown in the below screenshot. 9. You can see the cleared documents in the below screenshot. Conclusion: If you have same Supplier & Customer then you can clear the open items for Payables & Receivables partially or completely via this process flow. If you have any issues, you can ask in comments.